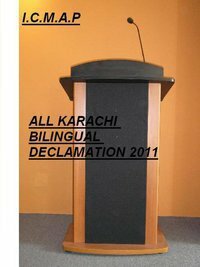 ALL KARACHI BILINGUAL DECLAMATION 2011 AT ICMAP. WE CORDIALLY INVITE YOU IN THIS MEMORABLE & REMARKABLE EVENT. LIFE OF A PROFESSIONAL PASSENGER. IS AZADI MEN MJHE ANDHEREY KA GUMAN HOTA HE. MEN AJ K HUKMARONON SE MUKHTALIF HUN.